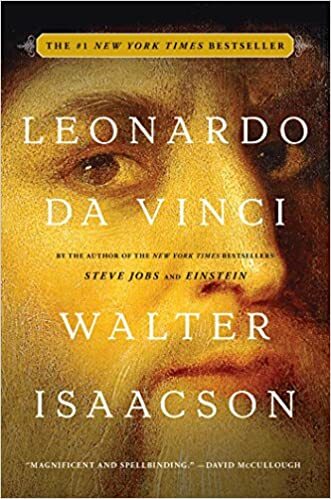 Isaacson’s analysis of Leonardo’s life, personality, virtues, and faults, is engagingly warm and human, bringing the deified icon of the Italian Renaissance back down to earth. That Leonardo was a genius is not in dispute—his wide-ranging expertise on everything from anatomy to optics to engineering to painting to architecture provide ample proof of his genius—but he was a flawed one, given to bouts of vanity, arrogance, self-doubt, and impatience. His reputation as a master of science and art was matched by his reputation for failure: commissions repeatedly went unfinished, and projects dragged on and on until patrons found someone else to fulfill their needs. Leonardo’s fascination with the why of things was both his greatest asset and his most profound impediment. Easily distracted, he would often skive off from one job to investigate a point of tangential interest, like setting a painting aside to experiment on how the optics of the eye affect the way we perceive color and perspective. Every activity led to another activity, and Leonardo’s insatiable curiosity and innate perfectionism drove him to understand everything. There is no question that Leonardo changed the worlds of both art and science, but in reading this book, I wondered quite often how the master would fare in our modern era. The world of the Renaissance was a time of intense investigation and study, a time where knowledge long lost was rediscovered, and new discoveries still lay about, waiting to divulge their secrets. Leonardo’s broad spectrum of interests, his keenly observing eye, and his fearless questioning of even the most mundane phenomenon, made him the perfect intellect for the time. His work in anatomy alone, built from dozens of dissections (both human and animal) and documented in gorgeous detail in his notebooks, were remarkably advanced and in some instances centuries ahead of his time. But how would his genius have expressed itself today? With Leonardo’s quicksilver mind and his curiously contradictory capacity for both distraction and monomaniacal focus, I do not believe that today he would be the master of influence that he was in the 15th century. Moreover, without a society where wealthy and powerful patrons keep artists on their payrolls, even Leonardo’s prodigious talent as a painter might well go unnoticed in today’s world. It’s easy to think of Leonardo as a pinnacle of human intellect, alongside such other polymaths as Newton and Aristotle, but if tomorrow he were plunked down in some suburban backwater, would we ever know of his existence? Naturally, Isaacson’s biography cannot and doesn’t even try to answer these questions, but the fact that it gives rise to such pondering means that it provides new and deep insight into the mind of a man revered the world over. Perhaps modern Leonardos exist, observing and studying the world from every angle, quietly moving from job to job to subsidize their gargantuan curiosity, achieving excellence in ways that will only be tossed aside by their uninterested heirs. It’s possible. But regardless of how Leonardo might get along today, we can still marvel at what he accomplished in his day, where he was the perfect mind at the perfect time. PS. To those pedants who complain that “da Vinci wasn’t his last name; it was just the town he was from!” please note that both Leonardo and his father, Ser Piero da Vinci, used their hometown as a surrogate surname, as did others who knew them. Florence first, then Rome I think. You’ll never want to leave Florence, whilst Rome, you can’t wait to get the hell out ! years. To prepare for these trips we all had to write up a file on the history, politics, geography, literature and the arts of that period for both cities. I was fascinated and learnt a lot. What I liked about Da Vinci were his drawings and his scientific and humanist mind. I haven’t stopped going back to Italy since then, with my parents, my husband, and later with my children. We are all going back to Venice again this Summer on our way back from Croatia. Can’t wait. I hope you have had the opportunity to discover this enchanting country or will in the near future. Have a pleasant week. I hope the snow is by now only a distant memory and that you are enjoying Spring weather. The snow is gone, and the buds of spring are swelling. I hope soon to visit my ancestral homeland (we argue over where to go first, Rome (her) or Florence (me)). I’ll wager this book will give you some new insight into the mind of the master. I think I need to check out this bio. I have been an admirer of Leonardo since sixth grade when I won an award for a paper I wrote about him. Seeing his works in the Louvre was deeply moving even though I don’t like his paintings as much as his brain. The level of dedication and scientific understanding in the painting I admire, but I’m with you, it’s the intellect and brilliance that intrigued me most.